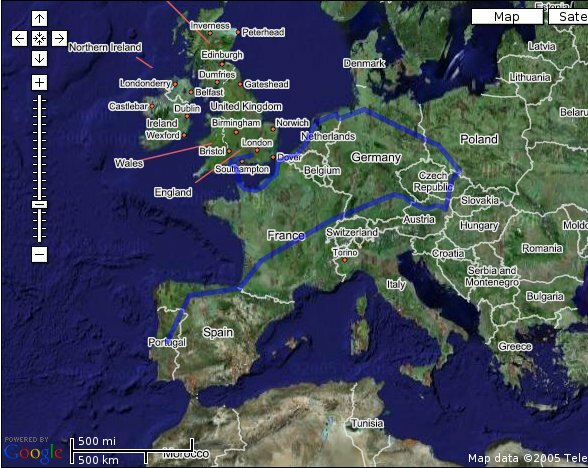 This is a rough plot of our intended route around Europe. It was plotted using Gmaps Pedometer (see interactive version of the route), which builds on the most excellent Google Maps (although I wish they had more detailed maps of the European continent). Although the intention is to tour continental Europe, we won't be leaving England straight away, because (a) one of us is guaranteed to forget something (b) we will be using new camping equipment and a new trike - so if something's going to go wrong early on, or we're missing something, we'd rather it was closer to home. From our current residence in Guildford, Surrey, we will head west towards my home county of Dorset where we will make a nuisance of ourselves to various family members, before leaving the country via Poole Harbour, crossing to Cherbourg. From Cherbourg we will stick vaguely close to the coast through Belgium, the Netherlands and Germany, taking in a section of the North Sea Cycle Route. At some point in Germany we'll leave the coast and head for western Poland. Poland's one of those cheap-but-not-too-dodgy countries that's interesting to us for potential habitation, so we may stop there a while and see what life's like there. After Poland, we'll stop our eastward travel and turn southwestwards towards the Czech Republic. This is where we start seeing proper gradients - there is a mountain range between the two countries. At Vienna, we will meet the Danube and follow it west back into and across south Germany. We'll have to get away from the Danube at some point, and it's probably best to do that before it hits the mountains. After that it'll be France again, trying to dodge the mountains wherever possible - unfortunately, with Portugal as a final destination, the Pyrenees are inevitable. Portugal seems like a good place to spend the winter months (cheap-and-not-too-dodgy, but also doesn't have Polish winters), so we will most probably end our trip there in the autumn. We will be visiting ten countries (OK, I included England) with eight different languages. We know a fair bit of French, a little bit of German and a few words in Spanish. Fortunately somebody had the bright idea of getting me a European Phrase Book for my birthday, which covers useful phrases in every language we'll need. And you can always communicate using pen and paper and/or wild hand gestures. Can I watch the bit where you cycle from Poole to Cherbourg?